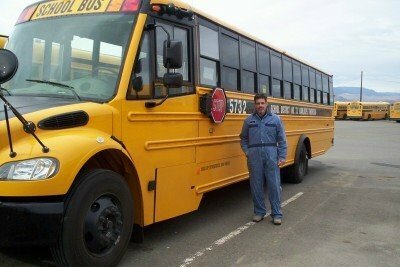 Hello and thank you for visiting my schoolbusmechanic blog. I have been posting here since 2006 and have 326 blog posts. I'm very grateful to those of you who have followed me through the years. 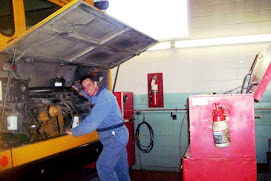 The mission when I got started was to share with the internet community what the job and responsibilities were for the average school bus mechanic. Some people would ask me if I was off for the Summer or didn't think there was much to do around the shop. On the contrary there is a shopping list of work on a school bus fleet including motor vehicle inspections, services, repairs and maintenance in other words "non stop work". I want to let you know that this blog will remain as is and will not be taken down due to the volume of information starting from 2006. Some of the videos are not showing up because I have moved them to a YouTube channel that I have partnered with called Mechanics Hub. They find mechanic jobs for companies all over the world and asked me to post videos to their channel and articles on their website. Below is the link to their Youtube channel where all of my videos are located. Most of the videos have links in the description to the article on the Mechanics Hub website. So please click the link below and 'subscribe' to receive all of my uploaded videos. I hope to see you there and as always send me your questions in the comments. An injector miss isn't too hard to detect since the engine code that showed up on the dash indicated a missing injector. This involved replacing the injector and a couple of seals on pressure sensors. The oil manifold is heavy and takes some work to move it on and off the top end of the engine. Once the injector is replaced and the hold down is torqued (22 ft lbs) the manifold sits on top supplying the high pressure oil from the HPOP (high pressure oil pump). This high pressure system can get up to 4500 psi so if there are any weak spots and a leak develops the injectors stop firing properly. One test that really works well is to remove the main oil feed hose from the high pressure manifold and apply shop air to the manifold seeing if there are any leaks. If so there may be a failed seal someh where in the system. If there are no leaks then there's a possibility of a bad IPR (injection pressure regulator) that screws into the HPOP controlling the pump output or the pump it self is not putting out pressure. Is this common? unfortunately yes we have changed out a HPOP and they are not cheap! $1700.00 while an injector runs around $500.00 which is Canadian funds. Yes it can a big owwie on the pocket book with these diesels. So I wanted to suggest something to anyone who runs MaxxForce engines. They are bad for premature engine wear so the easiest solution is to shorten engine oil changes. We are now changing engine oil at 6000 mile (10,000 km). It's a cheap alternative compared to a premature inframe. Our fleet has had to rebuild 4 of our 2010 - 2011 DT engines due to no compression / high blow by situations. This really drives up the costs replacing pistons, liners, rings bearings, cylinder rebuild etc. The labor on top of all this adds to the cost and down time. Another thing that would be worth going for is engine oil samples so engine conditions can be analyzed well before obvious problems occur. The results from engine oil testing covers everything from metals, fuel or coolant contamination. Well worth the cost! That's all I have to say about this subject. Leave a comments or questions below. The cold start on this bus was perfect without any hold ups. It was plugged in and the batteries are obviously in good shape. Of course with most diesel engines the white smoke is normal with incomplete combustion going on. Heat from compression is low in this case so it takes a while for normal combustion temperatures to occur. The rule of thumb with diesel engines in my book is to put the engine to work as soon as you get normal oil pressure or at least make sure the high idle mode is on. Idling a diesel in cold weather is not a good practice because of the build up of carbon and related combustion byproducts that happen with cold starts. These MBE 900 diesels are good solid engines except for the emissions which was adapted to the original block in 2007. The blocks can not be swapped from non emissions to these 2007 models because of added modules that were engineered to meet emission standards. I know this from experience we have a 2008 MBE that has a cracked block and no one can find me a bare block for it. There are plenty of non emission blocks around but nothing newer. The long block is available from the dealer but at a huge cost and a core charge that we would not get back due to the crack in the block. When the warranty was up with these engines we were in for a lot of challenges. The engine codes were running away on us with daily occurrences with the EGR valves, DPF diesel particulate filter, EOS electrostatic oil separator along with boost and charge air codes that did not let up. Two of these pushers were sports run buses and almost every trip they would radio back and tell me the engine was coding. One saving grace was the ignition key could be cycled on and off which would reset the code until it came back again. But this would stress me out regardless being helpless with the bus so far away. One bus was 4 hours out of town and I spent hours trying to line up a service call to do a parked regen or else the bus was dead in the water. Eventually these 2 bad boys were taken off of the sports run and we started using newer Cummins ISC diesel engines. The pressure was off and if you have read any of my other posts Cummins is my choice for a diesel engine medium duty ISB and ISC models. Yes they don't last forever there are quirks and failures but an extremely smaller percentage compared to other diesels on the road. Preventive maintenance had proven to extend down time and the extra cost is money well spent. Cummins ISB Diesel Engine Running from John Whelan on Vimeo. Just listen to that baby purr...doesn't it sound great? Cummins has won the "who makes the best medium diesel engine contest". These engines excel way beyond all others on the market. Caterpillar and Navistar collaborated with the MaxxForce design using HEUI injection and it could not keep up with emissions and those of us who still operate them are paying through the nose with repairs and labor to keep them on the road. Production has ceased for all MaxxForce diesel engines in the medium duty industry along with the latest shut down of the 9 and 10 models. Mercedes MBE 900 engine manufacturing shut down years ago because of the same reason not being able to pass the emission standards. We still have several of these engines running in our fleet and are kept on our toes dealing with emission issues. They have a sturdy block and top end but could never keep the engine clean enough to run the way it should have in the first place. Soot and ash is everywhere causing constant driveability problems. More reasons why my top pick is the Cummins ISB. It has the SCR system developed by Cummins engineers to reduce emissions down to Hydrogen and water. In other words zero levels of harmful oxides of nitrogen that pump directly out of diesel engine combustion chambers. Cummins uses diesel exhaust fluid to inject into a catalyst combined with the original diesel particulate filter design forcing bad emissions to it's knees. Our fleet will be nothing but Cummins ISB from here on in. There will be no guinea pig testing with us anymore with new diesel engine designs that salesman push with their over-enthusiastic promotions. Sorry guys that's not going to work in our fleet. We've got our hands full trying to keep up with inferior diesel engines that fail constantly and pick away at our operating budget. It's easy to talk the talk but we are the ones that end up pulling our hair out for years. I would like to thank Cummins for designing the ISB diesel engine with the end user in mind. Everything that has to be serviced is easy to reach... your software is excellent and down time is minimal. Think red...Cummins red if you're thinking about buying a truck or a bus. You will keep a lot more cash in your wallet and you'll spend a lot more time on the road. The EGR valve on this Mercedes MBE 900 diesel engine was under suspicion so we hooked up the software and went into the test mode. The valve can be moved to any desired position using the software which indicates if the EGR is faulty or not. In the video the valve moves correctly when manipulated by us. It's controlled by an electric motor that I have seen fail on occasion. Usually an EGR valve code will come up once the valve moves in the wrong direction. If you are unfamiliar what this valve does I will explain it's purpose. EGR cooled exhaust was one of the first designs in the engineering department by factory engineers to combat the levels of Nitrogen Oxide or NOx. By cooling the exhaust before it enters the intake system the NOx is reduced with lower exhaust temperatures and less oxygen levels. The disadvantage of this process is soot levels are increased with cooler exhaust levels in the combustion chamber. The DPF filter takes care of this down the line as long as the engine is worked hard and there are no mechanical issues like extra fuel or oil getting into the combustion chamber. The onboard computer controls the open and close routine of the EGR Valve. Up to 50% of the exhaust is routed into the engine intake according to the performance setting in the software. Different loads and speeds dictate the EGR settings. When the computer commands the valve to open to a certain percentage and it does not an engine code pops up. Poor engine performance will be the first sign there is a problem. Without the engine software your hopes are slim to none figuring out the problem. Codes are explained very well and most times it will lead you down the right path. That's it, emissions are here to stay and EGR valves are essential to control NOx. School Bus Allison Automatic Transmission Control Unit from John Whelan on Vimeo. School buses these days come with Allison automatic transmissions. In my opinion there's no other choice for running gear. Allison has got it nailed with engineering design and software. We just purchased the newest Allison software and it does a nice job of laying everything out with troubleshooting and tutorial videos all in one. Recently one of our Navistar conventional buses was on a field trip and called in with the transmission not wanting to shift. I went out and for some reason after cycling the key a couple of times the bus was limped back to the shop. The basic checks are transmission codes and wiring connections, bad wiring from the TCU to the transmission. The code P0614 was a torque data fault which is a communication problem between the TCU and ECU (engine module). There is no schematic to follow it's all about how much torque the transmission will allow from the engine. This feature was put into place to protect the transmission from damage if for some reason i.e. the engine delivers too much torque due to over fueling. After checking all of the pin connections and the wiring the J1939 resistance was checked and we got a reading of 57 ohms which is normal. If you're not familiar with J1939 it is the network of communication between all of the vehicle control modules.The engine, transmission, ABS brakes, body control module etc.... so if there is an issue with this system the messages will not connect properly and strange things start to happen. The green and yellow twisted pair of wires goes to each module so a high speed signal will occur when the operator wants to shift into a certain gear or signals the ABS module that braking is taking place and so on. The modules read it's sensors and adjusts to accommodate any changes such as driving up a hill or coasting on the highway. When there is a bad wire in this twisted pair the messages will be all mixed up and something in the operating system will fail followed by a fault code on the dash alerting the driver. A great advantage we have running a fleet is there are buses with the exact same specs. which gives us the ability to swap modules to cancel it out during troubleshooting steps. In the case of the P0614 code when we changed the TCU with a good working unit from another bus the code disappeared. This saves the guessing game and the rules are when you order an electronic part and use it you own it. The price for these modules are well over a thousand dollars so be sure before you order one. They have to be specially programmed according to the part number of the original module and the specs related to the vehicle serial number so I'm sure returning it would be a hardship. Thanks for reading this post I hope it helped out!! The emission controlled diesel engine causes a lot of soot and ash build up through out the intake and exhaust system. The sticky GOO that invades literally every square inch of the engine's components has to be removed by way of passive or parked regenerations or physically cleaning off the build up before it's too late. The video shows us using a household cleaner to soak the diesel particulate filter from a Mercedes MBE 900 diesel engine. This filter was condemned by one of the local shops we took it to for cleaning. They baked it at extreme temperatures to remove as much residue as possible. In this case the test for flow was too low for them to give it a pass. So our options were to buy a cleaned DPF from the Mercedes dealer for $800.00 or experiment on our own with 'Mr Clean'. In the past we've used it to flush out cooling systems when there's oil contamination or for removing soot from small emission parts but this was something we wanted to try since there was nothing to lose. Mr Clean is an excellent degreaser so our plan was to let the DPF soak for 2 days and thoroughly steam clean it off. I'm happy to report that since reinstalling this DPF there has been no fault codes for close to three months. The typical 2631 code (turbo boost performance) has not reared it's ugly head for some time now. Since then we've done 2 more buses with the same success. How long until the DPF starts to get plugged up again is hard to say. They're supposed to be serviced or replaced around 150,000 km according to the Mercedes estimate but that's up for discussion. The plastic drum we used to soak the filter was a used DEF container. One gallon of Mr. Clean is all it takes to get a good strong solution. The soot and ash collected on the filter is liquified so when you use the steam cleaner it comes out looking really good. Park Brake Not Releasing C2 School Bus from John Whelan on Vimeo. The park brake on a Thomas C2 school bus has an interlock that requires the service brake to be applied before the park brake releases. Most of the issues we had was the stop lamp module and park brake module located at the air management unit depending on the year of the bus the bank of modules are at the very back in front of the differential housing or behind the transmission. There was a recall years ago regarding the stop lamp switch located on the right side of the AMU looking towards the back end. The problem was the internal switch wasn't contacting properly so Thomas revised the design and there have been very few problems since then. If you go into accessfreightliner you can bring up the AMU layout for the VIN you're working on. The park brake light on the dash is a warning to the driver not to drive away with the park brake on, When a driver pulls out the park brake valve the modules sense this and through the J1939 messaging system air pressure changes trigger a signal that is sent back to the dash illuminating the park brake light. When you come to a stop and shut down the engine if the park brake valve is not activated this triggers an alarm until the park brakes are applied. Unless there's an air leak most of the trouble with AMU modules is the switch contacts. The first check is to see if the brake lights are working if not the stop lamp switch in the module can be tested by jumping the signal to the bulk head module bypassing the internal switch in the module. If the brake lights work there is a problem internally with the stop lamp module. The same test can be done with the park brake module. In the video the two terminals that sends signals to the BHM are jumped and if the park brake indicator light comes on then there is an internal problem in the module itself. There are only two wires to this module so it's a straight forward test. Most of our troubles have been with these 2 modules. Also you can not rule out opens and resistance in the wiring harnesses. This is another possibility that you might have to deal with. If you have a Freightliner dealer in your city you need to get a user and password to the accessfreightliner website. Here you will find the schematics and troubleshooting required to fix an electrical problem. Without this information it's very difficult to blindly find an electrical fault especially with multiplexing that's here to stay for a long time.